The rudder began vibrating and then groaning. In a quick-rising Lake Superior storm I was slewing along on a series of big waves, sometimes going sideways. My home-built plywood rudder was taking a beating. Bending over Persistence’s transom, I saw that the blade seemed OK. Still with all the racketing and noise, the rudder was under considerable stress. What if the rudder broke? How would I steer in a storm? I had a plan: I would attach a line from my portside cockpit winch to my big 14-pound Danforth, and then attach another line from my starboard winch to the Danforth. And throw everything overboard. The Danforth would drag in the heavy weather’s following seas but I could crank it from side to side. I had tried something like this before. For my young son I had built a toy boat out of a 2 x 4 piece of lumber and wrapped a knot around one end. In the water, towing it behind my boat, the toy boat swung to one side and my 17-foot sailboat would turn that way. Eureka! Accidentally, I had another steering method. That would be my untried plan. 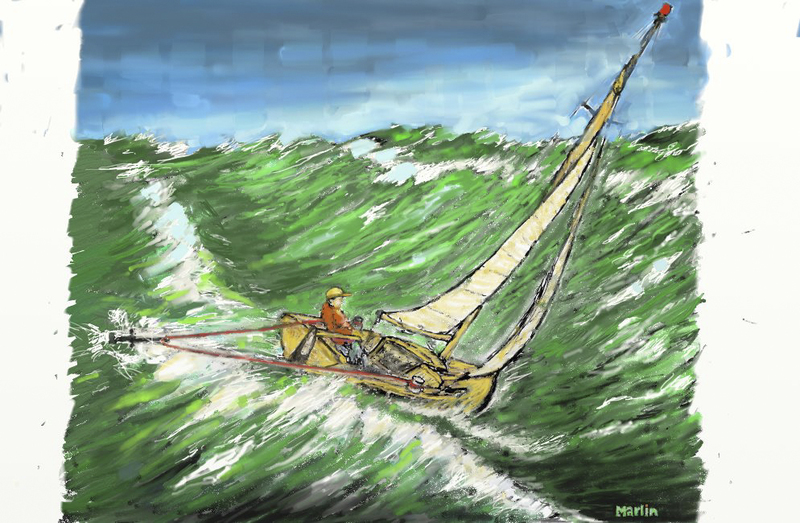 But one day I heard the tale of Dudley Dix, the ingenious South African designer who draws and sails marvelous ocean racers—built out of plywood—to frolic in the boisterous waters off Cape Town, not far from the horrific seas at the Cape of Good Hope. He was blasting along in his 36-foot plywood rocket in the Cape Town-to-Rio ocean race. Suddenly his plywood blade broke. Black Cat spun around. Dudley went below, found a large bucket, tied two lines to its handle, connected each line to a cockpit winch, and threw the bucket overboard.The steering drogue worked fine, he told me, and he and his crew sailed confidently several days with the lash up, ignoring offers of a tow from other boats. The bucket? It was a heavy-duty metal bucket of the type South African construction workers and bricklayers use. In the trans-oceanic race, rules require the sailors to carry a bucket aboard. I don’t carry a bucket, but I do have three Danforths and a mud anchor onboard. Maybe they’d work in an emergency. 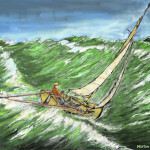 Marlin Bree (www.marlinbree.com) used the bucket steering story in a chapter in his novel, Broken Seas (SCA Library). He is a contributing writer to Small Craft Advisor and the author of numerous boating books. He has twice won the coveted Grand Prize Award in Boating Writers International’s annual Writing Contest.